Last month in the UK a new £5 banknote printed on polymer, a thin flexible plastic film, was issued. The new note bears the image of wartime leader Sir Winston Churchill on the reverse. The new note can apparently last about five years longer than paper notes and features loads of new security features, making the note extra hard to counterfeit. They include a see through window featuring the Queen’s portrait as well as the Elizabeth Tower (commonly mistakenly known as Big Ben) depicted in gold foil on the front of the note and silver on the back. The £5 will be joined shortly by new £10 and £20 notes which also will be printed on polymer. 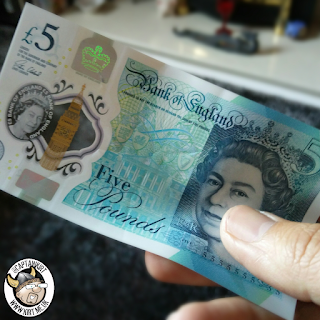 Since the new notes came into circulation there has been a movement on social media under the hashtags of #firstfiver and #fivergiver to donate the first £5 note you receive to charity. I got my first one this week and thought it was a great idea to give it away so I donated my first fiver to Action for ME, a life changing condition my wonderful Morticia has struggled with for almost 10 years.